The BBC released a story today trumpeting the initial sale of a remotely controlled octo-copter built specifically for crowd control situations. 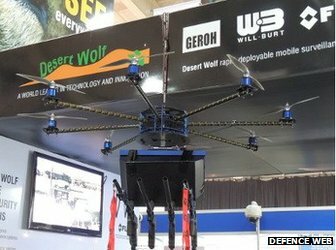 South African manufacturer Desert Wolf says its eight rotored “Skunk” can fire 80 doses of pepper spray per second from a storage tank holding 4000 pepper spray paintballs, plastic balls or other “non-lethal” ammunition. Call them drones, RPVs, UASs, UVAs, SUAs or whatever. Remotely controlled robots are a big business in San Diego. A recent Voice of San Diego series covered the nascent industry’s impact on the local economy (more than a dozen companies),along with the uncertainty surrounding their use and development. While I’m sure these machines can and should be be used for good purposes, the BBC story brings to light yet another moral dilemma facing society as technology continues to advance. The drone also includes on-board speakers to warn crowds, as well as bright strobe lights and “blinding lasers” to disorientate victims. Blinding lasers are prohibited for use in war under the auspices of the Geneva Convention. The industry knows it has an image problem stemming from press accounts about military/intelligence agencies extensive of use–including remote controlled assassinations– of armed drones in various overseas conflicts. Guy Martin, the editor of Defence Web, said he believed the drone was unique. Today’s coverage in the BBC and elsewhere demonstrates the need for legislative action severely restricting the use of these weaponized robots, particularly on people attempting the exercise their first amendment rights. AB1327 was overwhelming passed by the Assembly back in January. It is still being considered in the Senate. Despite the seeming good intentions of the legislature, recent history makes it clear that the allure of military hardware (especially when it’s been declared surplus) is too strong for many law enforcement agencies to resist. The American Civil Liberties Union has launched a nationwide effort to discern the true scope of the militarization of policing. In 2013, ACLU affiliates in 25 states filed over 260 public records requests with law enforcement agencies to document the impact of excessively militarized policing on people, families, and communities. 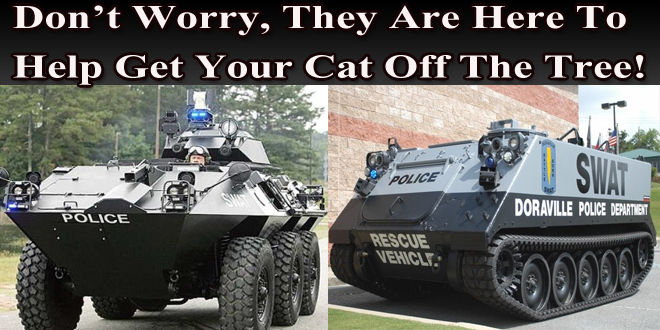 In addition to being an astounding waste of taxpayer money, this equipping of police with military-grade equipment and weapons also gives rise to a dangerous mindset in which police feel compelled to put their newly high-power toys and weapons to use. The results are deadly, as can be seen in the growing numbers of unarmed civilians shot by police during relatively routine encounters and in the use of SWAT teams to carry out relatively routine tasks. For example, a team of police in Austin, Texas broke into a home in order to search for a stolen koi fish. In Florida, over 50 barbershops were raided by police donning masks and guns in order to enforce barber licensing laws. Thus, while recycling unused military equipment might sound thrifty and practical, the ramifications are proving to be far more dangerous and deadly. This is what happens when you have police not only acquiring the gear of American soldiers, but also the mindset of an army occupying hostile territory. In this way, the American citizen is no longer seen as an employer or master to be served by public servants like police officers. With police playing the part of soldiers on the battlefield and the American citizen left to play the part of an enemy combatant, it’s a pretty safe bet that this particular exercise in the absurd will not have a happy ending. Local law enforcement agencies told the Voice of San Diego that they are not–at present–using drones. Police in Los Angeles and Tijuana have already purchased drones for surveillance purposes. Scandalous and illegal behavior by SDPD officers over the past few years led to a widely held consensus that using body cameras would discourage future rogue cops. Police Chief Shelley Zimmerman rolled out the department’s guidelines for the body camera program yesterday before the City Council’s Public Safety and Livable Neighborhoods Committee. The cameras will always be on during an officer’s shift, recording in 30-second loops so that video of the moments leading up to an interaction will be saved, she said. The officer will activate full video and audio recording before a contact. The chief said officers will not be required to inform citizens that they are being recorded, but should acknowledge it when asked. They will also not be required to stop recording if a citizen makes a demand, she said. Given the SDPD’s past record with anti-establishment demonstrations, I’m fairly certain the cameras will be on, period. Not everybody was thrilled about the new policies. 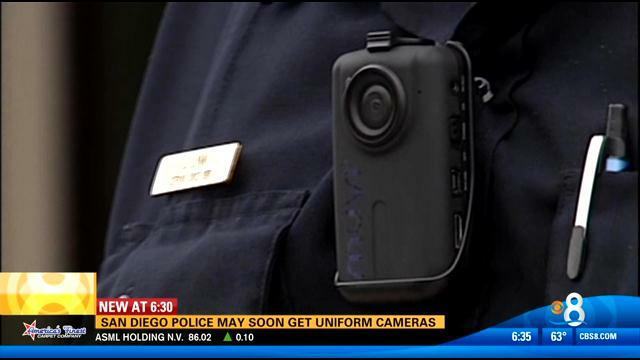 To the chagrin of the ACLU of Southern California, a new San Diego Police Department policy on body cameras released Wednesday would give officers discretion over when to record an encounter. The first 75 cameras will go into full-time use by the end of June, according to Chief Zimmerman. 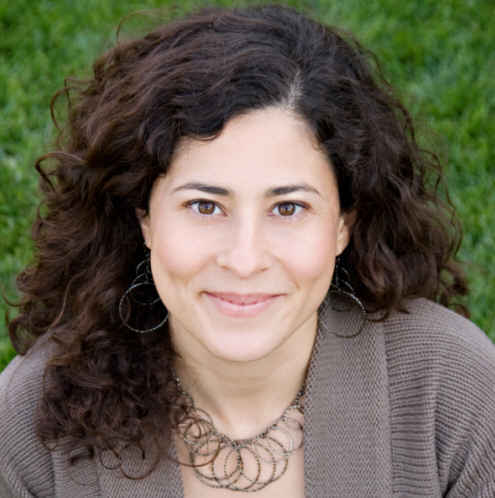 The right wing effort to recall Escondido City Council member Olga Diaz has fizzled. Back in January Diaz was handed a copyof a ‘Notice of Intention to Circulate a Recall Petition’ beginning the legal process to recall her as the third district representative to the City Council. The petition complained that those signing do not want to be represented by Diaz and feel that waiting until 2016 for an opportunity to elect someone else is too long. Diaz just happened to be the only Latina on the Council. The deadline for filing signatures of 10 percent of registered voters in the third Council district passed at yesterday at 5 p.m.without any petitions being filed with the Escondido City Clerk. Missing the critical deadline means the issue cannot appear on the November ballot. Diaz was the only no vote yesterday as the Council voted 4-1 in favor of a proposal to ask voters in November to make the city of Escondido into a “charter city.” The vote was sans discussion or debate. The move to switch cities’ status around California is being led by right wing groups as a tool to insulate municipal contracts from prevailing wage laws. Supporters are the same groups that have failed at pushing various anti-union initiatives in state-wide elections in recent years. Cities with charters are exempt from some state regulations and have greater autonomy regarding fees, zoning, taxation and other issues. They also have greater “freedom” to go bankrupt as happened in Bell, California. Opponents say the charter proposal is unneeded and a way for the conservative council majority to grab more power. A similar proposal was rejected by 53 percent of Escondido voters in 2012, but this time council members think it has a better chance because two controversial components have been removed regarding elections and wages. The City Council voted 4 to 1 (Diaz opposing) to place a new charter proposal on the November 2014 ballot. Mayor Abed did not respond to requests from Escondido residents to create a citizens commission or committee for public input. Instead he says having a workshop and two public hearings provided an ample opportunity. A fact: there have been four opportunities for residents to comment on the charter city proposal. Not one resident has spoken in favor. For additional information on charter proposals, visit www.CharterWarning.com, provided by the Middle Class Taxpayers Association. A local group also has a website at www.EscondidoCharterWatch.org. « Junco’s Jabs: Please, Sirs Sanders and Faulconer, We Want Some More. Although the charter city movement has its drawbacks, charter cities are also in a position to start up a public bank whereas non-charter cities are not. I guess which direction a charter city decides to go in is up to whomever is in control of the charter city. Why is it that only right wing initiatives are considered? I guess because the left wing has no imagination and can’t put its clout behind the public banking movement which would benefit citizens probably more than any other single thing. Another component to the growing militarization of police forces is the increase in numbers of former military who join police forces. After all, where else can they still play with guns on the job. Perhaps now local PDs and Sheriff departments are now doing their own recruiting.